One of America's best-known automotive journalists -he’s listed in Who’s Who in America- is writer Patrick Foster. A dedicated historian/author with broad experience in the auto industry, Foster’s been writing about automobiles for more than twenty years. His work has appeared in Hemmings Classic Car, Chrysler magazine, Automobile Quarterly, Automotive News, Jeep magazine Collectible Automobile, Forward (magazine of the Chrysler Museum), Reader’s Digest, Hemmings Muscle Machines, Dodge magazine, Cars & Parts, Strada, Special Interest Autos, AutoWeek, Car Collector/Car Classics, Automotive History Review, Journal of the Society of Automotive Historians, and other periodicals. Foster has regular columns in Hemmings Classic Car and Old Cars Weekly. Foster is the hobby’s leading spokesman for America’s independent automobile companies. He’s considered the foremost authority on Jeep and American Motors Corporation and related brands including Rambler, Nash, Hudson, AM General, Jeffrey and Lafayette and is also a recognized authority on Studebaker. Foster has assembled thousands of vintage factory photographs and automotive literature into an archive called The Patrick R. Foster Historical Collection. Foster has written 13 books, including ‘American Motors-The Last Independent’, ‘The Nash Styling Sketchbook’, ‘The Metropolitan Story’, ‘The Story of Jeep’, ‘Super ‘70’s-Cars of the Disco Decade’, ‘Rambler 1950-1969 Photo Archive’, ‘The Standard Catalog of Jeep’, ‘AMC Cars 1954-1987 Illustrated History’, ‘The Story of Jeep 2nd Edition’, ‘AMC Performance Cars 1951-1983’ and ‘AM General- Hummers, Mutts, Buses and Postal Trucks’. He co-authored Mister Javelin- Guy Hadsall Jr. at American Motors. His newest book is “Studebaker - the Complete History” released in June 2008. Foster is currently working on a book on Kaiser-Frazer. The author has won numerous writing awards. 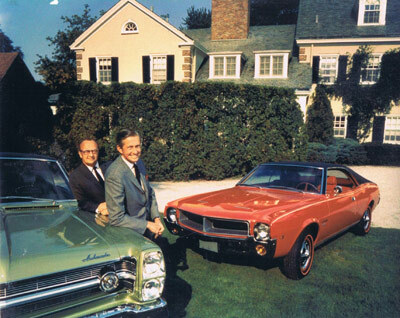 His American Motors book was named an Outstanding Book for 1994 by the Antique Automobile Club of America (AACA). The Metropolitan Story was awarded a Bronze Medal by the International Automotive Media Council. Foster’s The Story of Jeep won the AACA's prestigious Thomas McKean Memorial Cup Award as the best book of automotive history for 1998. In 1997 Foster received the highest honor awarded by the Society of Automotive Historians for magazine writing when a biographical article on George Romney, which appeared in Automobile Quarterly, was named Outstanding Periodical Article for the year. Foster also served as head of the Nash Car Club of America's (NCCA) Nash Heritage Preservation Project. Over a six year period he interviewed former Nash dealers, factory workers and executives, recording their reminiscences on video and audiotape for the NCCA's historical archive. In 2003 the Society of Automotive Historians recognized Foster’s work by presenting him with the prestigious James J Bradley Distinguished Service Award by for “an outstanding job in the preservation of historic materials...”. In 2005 Spike TV asked Foster to serve on the celebrity board that selected nominees for the world’s first-ever televised automotive awards program. In addition, Foster has appeared on CNN, DaimlerChrysler TV, along with television and radio talk shows. He was featured in the television documentary “Women and the Automobile”, in which he explained the special significance of the Nash Metropolitan, a car designed primarily for women. He has a prominent role as commentator in the documentary film “Jeep-The Legend Continues”. He appears in an upcoming racing documentary created for PBS and also has worked as a consultant for a major cable TV channel. In April 2008 Foster spoke at the University of Youngstown, Ohio on how America’s independent automakers influenced the auto industry. Foster’s a member of MENSA- the international society for people with high IQ's. He also belongs to the Society of Automotive Historians Inc. and served on the Board of Directors. Mr. Foster founded the organization’s publishing venture, The SAH Press. Foster is a popular banquet speaker and also conducts seminars on automotive history. Among his scheduled appearances this year: in September he’ll appear at the Studebaker International Meet in Lancaster, Pennsylvania, in November at “Meet the Authors” at the National Automotive History Collection in Detroit. For other appearances please call the Olde Milford Press at 203 877 6717. Foster’s publicist is currently preparing a schedule of book signings.